Anchored: Collecting coral is banned on fishing trips in th region. Crabs ran helter-skelter at the sound of my approaching feet as I hurried to the shore to watch fishermen cast their nets into the turquoise depths of the ocean. On the horizon, the first rays of the rising sun broke through the cloudless, star-sprinkled sky, lending a mystical dimension to the landscape. The boats became silhouettes, the men little stick figures, as elemental as the environment. I could have walked away from Lakshadweep with this picture postcard image in my head, come back to the mainland and waxed eloquent on the shades of blue and the colours of the coral. But a solitary asphalted road snaked away invitingly just beyond the coconut groves lining the beach. There, beside one of the few autorickshaws to ply in Agatti, stood Aamirah. For the first half of the day, the 34-year-old is a fisherman. Once the sun rises high in the sky, Aamirah comes back to earth to transport people and goods from one end of the island to the other. Not that it is much of a stretch. At just 6km across and 1,000m wide, like most of the islands in the archipelago, Agatti could get on an energetic morning walker’s nerves. Yet, that 30-minute ride opened my eyes to the other side of the island. Just as a walk-through of a five-star hotel’s innards opens one’s eyes to the staff to guest ratio, so the drive through Agatti revealed the precarious balance that must exist between tourism, the territory’s main source of income, and the environment, the backbone of that industry. “There, that is the power generating unit," pointed out Aamirah. In English picked up through conversation rather than in a classroom, the swarthy islander explained that the huge solar panels were the mainstay of the island’s power supply. With its tropical location, sunlight is usually not in shortfall in Lakshadweep, but on days when the sky is overcast, people have to fall back on diesel generators. “And that is a dirty fuel," Aamirah nodded solemnly. “So we use it sparingly." Packed with almost 100 coconut trees to the acre, the interiors of Agatti resemble every other island in Lakshadweep. Except one, all the islands are aligned in a north-south direction and are boat-shaped—long and narrow. The road we were travelling on broke into several little streets and lanes and, without warning, we were in someone’s backyard. A bunch of children playing nearby converged on the autorickshaw, as curious about my camera as I was about the beautiful clay tiles on some of the houses. Conversation was surprisingly fluent, in a mix of a local dialect of Malayalam and broken English. “It’s a peaceful life," acknowledged Tasawwar, a fisherman who appointed himself my guide. “The women work with coir, the men fish—that’s how we support ourselves." That is not to say, however, that the islands are stuck in a time warp. In the heart of the village, next to the solitary ISD-STD booth, is a community Internet service. With the administration actively encouraging primary education, every child in the matriarchal society goes to school, and almost every adult can read and write. That—or perhaps an ancient instinct—explains the ease with which the archipelago accepts its limitations. Drinking water is strictly rationed, with the authorities supplying a minimum quantity to each family, depending on its size. For food and groceries, Lakshadweep is dependent entirely on the mainland. For locals and tourists alike, supplies arrive once a week; if the weather acts up, so do the food supplies. That’s why outsiders are advised to cart along their brands of cigarettes and night creams: There’s simply no concept of running out to the nearest store for replenishment. Passing through the village, I arrived at a quaint lighthouse and a fair-sized jetty, where a few fishing boats had just drawn up with their bounty. The lagoon, sandbanks and open reefs of the islands are rich in marine life but, as with natural resources everywhere, are more scarce today than ever before. On this day, though, the mood was upbeat: One of the fishermen had netted a large tuna and his smile rivalled the sun as he held up the 45-pounder (about 20.5kg) for my camera, the template for trophy-hunters everywhere. The principal reason the photo op was possible lies in the kid gloves with which the administration has handled Lakshadweep ever since it was opened to tourists in 1974. Till date, Bangaram—an uninhabited island till the Hotel Corp. of India Ltd set up a resort here—continues to be the only island open to foreigners and the only one to allow consumption of alcohol. Plastic is banned, littering is forbidden and collecting coral is a punishable offence. Back in my hotel on the seafront, I wondered again at the tightrope everyone on these islands walked every day. A single plastic bag, flung carelessly into the sea, can smother a coral reef. A single tourist group, unmindful of water-rationing, can throw the supply out of gear. And yet, and yet. As long as the sun keeps rising and setting over the spectacular seas, as long as the glass-bottomed boats allow visitors to gaze at the astonishingly varied marine underworld, as long as the trees produce the sweetest, most tender coconuts, the tourists will keep coming. If only there was some way they could give back to the islands as much as they take away, the fragility of the ecosystem would cease to worry. All visitors to Lakshadweep require a special permit from the government of India. Most travel agents will be able to organize these; alternatively, contact the secretary to the administrator, Union territory of Lakshadweep, Indira Gandhi Road, Wellington Island, Kochi-682003 (Tel: 0484-2668245, 2319664). Indian Airlines flies between Kochi and Agatti—the only airport on the islands—six days a week. Round-trip current fares are around Rs10,000. Kingfisher also flies the same route on Tuesdays, Thursdays and Saturdays; round-trip fares are around Rs9,000. Four passenger ships—MV Tipu Sultan, MV Bharat Seema, MV Amindivi and MV Minicoy—operate between Kochi and Lakshadweep. The voyage lasts 18-22 hours. One-way luxury fares are around Rs4,500. Of the 36 islands, 10 are inhabited. 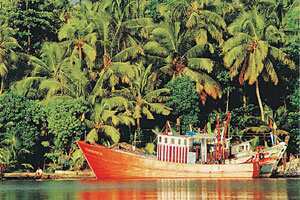 Only six islands are open to tourists; foreigners may stay only at Bangaram. The Society for Promotion of Nature Tourism and Sports runs most of the available accommodation, and offers various multi-island packages. Check out www.lakshadweeptourism.com. We stayed at the Agatti Island Beach Resort (http://www.agattiislandresorts.com). The Kochi office is behind HPO, Market Road, Kochi-682011 (Tel: 0484-2362232; email: agattiisland@sancharnet.in). It offers 20 independent cottages with an exquisite restaurant serving Indian and international cuisine. All-inclusive two-night, three-day packages cost Rs26,800 for a couple. At Bangaram, the Casino Hotel group runs the Bangaram Island Resort (http://www.cghearth.com/bangaram_island, Tel: 0484-3011510), offering deluxe bungalows and a variety of outdoor pursuits, including deep-sea big game fishing. Inclusive of accommodation and all meals; cost per couple per night is around Rs14,500. All resorts offer well-organized aquatic sports such as kayaking, snorkelling, scuba-diving, glass-bottom boat riding, canoeing, skiing, excursions to nearby islands, fishing et al. Charges for these activities are extra.